A Vincentian, who is facing kidnapping and murder charges in his Caribbean homeland, has been fingered as a key suspect in one of New York city’s most infamous cold cases involving a Brooklyn high-school honors student, The New York Post has learned. New York Police Department (NYPD) detectives have already travelled to St. Vincent where they interviewed the suspect behind bars, after one of his ex-girlfriend’s squealed on him and related that he had confessed to her about the murder of a teenage girl in New York. 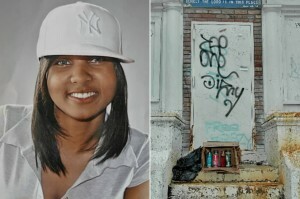 Chanel Petro-Nixon, 16, went missing about 10 years ago on June 18, 2006 — that year’s Father’s Day — and was found four days later strangled inside a garbage bag in Bedford-Stuyvesant. After years of frustrating dead ends in the case, cops and investigators from the Brooklyn District Attorney’s Office have now zeroed in on Veron Primus, a former high-school friend of the victim, according to an investigation byWPIX/Channel 11. In a segment airing Monday, “Crime Watch Daily’’ reporter Mary Murphy travels to the suspect’s native home on the Caribbean island of St. Vincent, where he is in prison facing kidnapping and murder charges in other cases. Murphy interviews Primus’s ex-girlfriend, Mewanah Hadaway, who shares a harrowing tale of allegedly being held in a crude wooden enclosure in the suspect’s backyard for three and a half months. While he held her captive, Primus allegedly showed Hadaway news clippings about the Petro-Nixon case and made statements about killing a girl in the United States, Murphy says. Hadaway eventually escaped Primus, now 29, by slipping a note to a housekeeper, who went to the police. The NYPD believes that Petro-Nixon also was held before being killed and dumped on a sidewalk just a mile from her home, according to the report, which airs at 2 p.m. In addition to Hadaway’s kidnapping, Primus has been charged with killing a St. Vincent real-estate agent after local cops found evidence of the crime during their investigation into the ex-girlfriend’s case, according to Murphy. NYPD cops interviewed Hadaway in April and returned to the island last week to meet with St. Vincent police, according to Murphy. Law-enforcement sources told Murphy the St. Vincent sit-downs have been “very fruitful,” although Primus did not confess to murdering Petro-Nixon and requested a lawyer after 45 minutes of questioning. Petro-Nixon was a straight-A student whose corpse was found with a chemical scar on her leg, possibly from bleach that her killer used to mutilate her, investigators have speculated. A pimp had previously been unsuccessfully linked to her death. The hustler had been arrested for the murder of an 18-year-old girl, whom he picked up after she left a Chelsea nightclub, a month after Petro-Nixon’s disappearance and around the same neighborhood.